Very few beer brands survive today that have modern examples to put into a worthwhile four-decade vertical tasting. That’s simply because forty years ago there were hardly any beers being brewed that had the longevity to be still drinkable when even the most junior brewer involved in their production is now at or approaching retirement age. It wasn’t looking good for Courage Imperial Russian Stout, which was one of less than a handful of strong beers capable of great age being brewed in the 1970s and which stopped being made in the early 1990s despite a history going back more than two centuries. But Courage IRS, doubtless in considerable part because Michael Jackson’s World Guide to Beer in 1977 featured it across two pages, has inspired a huge number of imitators in the US and created an extremely popular beer style in the process. When the Bedford brewer Wells & Youngs acquired the rights to the Courage beer brands from Scottish & Newcastle in 2007, the first two beers from the old Courage stable Wells produced were the Best Bitter and Directors Bitter. 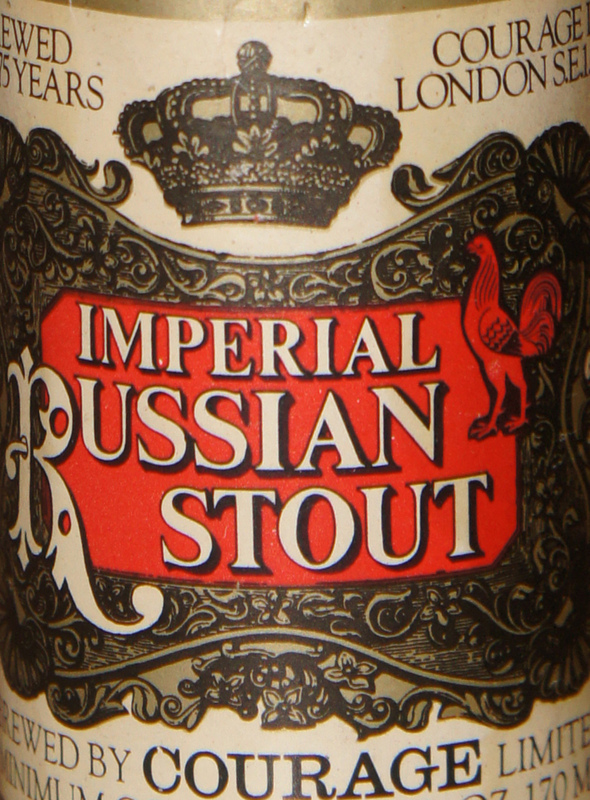 But I am sure it quickly occurred to the company’s marketers that here was a chance to bring back a truly iconic beer, which would surely have an instant appeal in the US as the ur-IRS, the Imperial Russian Stout in honour of which all others are named. Thus in May last year the Bedford brewery produced the first new brew of Courage Imperial Russian Stout for 18 years, two bottles of which they’ve been kind enough to send to me, to my great delight, as I love a good IRS. And because I’m the sort of sad nerd who stuffs bottles of beers away for decades, I was able to pull out examples of Courage IRS from 1975, 1985 and 1992 to compare against the latest version. 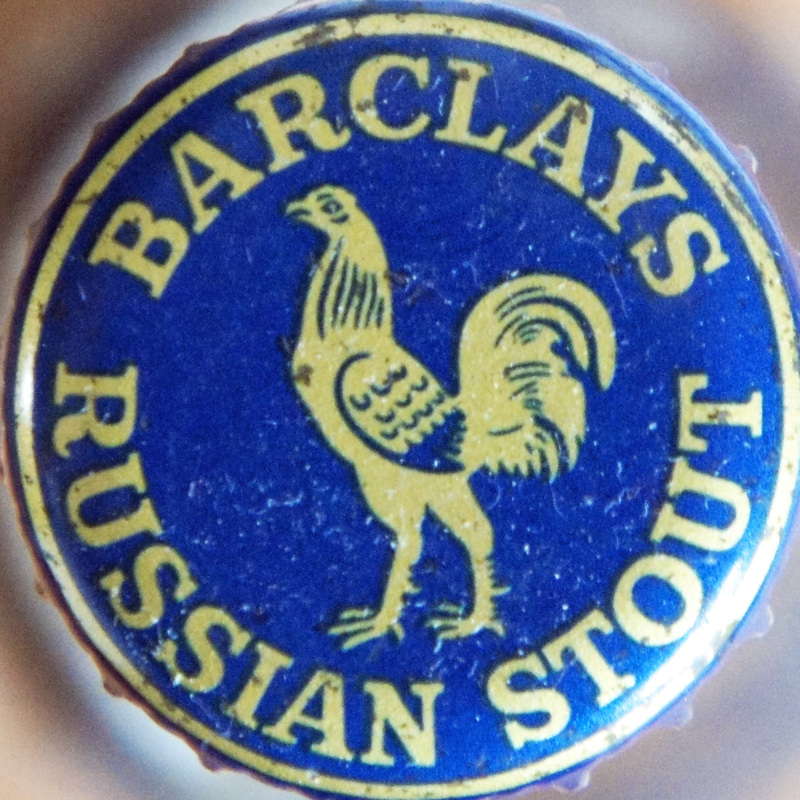 The 1975 version, made at the Horsleydown brewery by Tower Bridge in Bermondsey, South London, actually has a bottle cap that says “Barclays Russian Stout”, reflecting the original brewer of the beer, Barclay Perkins of Southwark, which merged with its near-neighbour Courage in 1955. It opens with a slight “pfft”, always a relief with old bottled beers, and there is an instant aroma of chocolate, meat and coffee. The beer is totally black and pours with no head, but a fair amount of condition is apparent in the mouthfeel, and it’s entirely drinkable still after 37 years, rich and full, though without much complexity. There is a burnt malt bitterness, little trace of hops, and sweet chocolate comes through at the end. You would not guess this was a beer almost four decades old: it would still be a fine match for a chocolate dessert. On another 10 years to the 1985, brewed at the John Smith’s brewery in Tadcaster, Yorkshire after the closure of the Horsleydown brewery in 1981. There is no sound on taking the top off, but a slight petillance shows up in the glass. The initial nose is of liquorice and dark brown toffee, and the colour is extremely dark brown, rather than black. The mouthfeel is thinner than the 1975, and the flavour is baked raisins and burnt batter: indeed, I found I was thinking of Garibaldi biscuits, which, by coincidence, were also once made in Bermondsey. This is less bitter than the ’75, but still remarkably drinkable for a 27-year-old beer. Seven years later, in 1992, IRS was still being made in Tadcaster, though this was the penultimate year of brewing IRS by Courage. Twenty years on, it has an almost whisky-like nose, and the condition has again very nearly disappeared. The colour is back to black, and the mouthfeel is oily and sharply alcoholic. Sweet chocolate is still the loudest note, but underneath are bitter orange and, again liquorice. This is a lovely, heartening, rich beer and quite astonishing for its age: very enjoyable. Before I got on to the resurrected Wells & Young edition, I was lucky to have another revived version to try: Ed Wray of the Old Dairy Brewery in Kent sent me last year his “cloned” version of Courage IRS and, fortunately, I had decided to wait a few months before drinking it, which meant it was around to be included in this multi-decade test. Ed’s IRS pours a lovely creamy head, and cream-and-chocolate were the major initial attributes. This was not, on my brief encounter, a particularly complex beer, but very enjoyable. The W&Y IRS, made in May 2011, also pours a great head, but before that comes a massive hit of hop aroma on the nose: this is a beer that smells and tastes as if it has been rammed full of English hops (Fuggles was my guess, though I see from Des de Moor’s tasting notes that they were actually Styrian Goldings, which are, of course, despite their name, Fuggles-grown-in-Slovenia.) The first bottle, I was struggling to cope with the bitterness (I’m not a fan of strongly hop-aroma-forward, bitter-flavoured stouts), but as Stan Hieronymous has wisely pointed out, you can’t judge a beer properly on just one glass. The last time I drank Courage IRS anything like this “new” was in 1994 in the Forester in West Ealing, one of the few pubs selling the beer at the time, which had the 1992 version. I don’t remember it being then as noticeably smack-your-nose-with-hops as the W&Y version is: maybe it’s just me, though, as a quick check shows no one else tasting the beer seems to comment about the head-in-a-hopsack sensation I was getting. That (to me) over-hoppiness will, I feel fairly confident, die down over the next year or two, making this a beer I really, really want to come back to about May 2013, and again in 2014. And, ideally, in 2021. Wells and Young’s head brewer, Jim Robertson, apparently set out to recreate the Courage IRS he remembered from the start of his career as a brewer, and it looks quite likely that he has succeeded in recreating a beer with the same massive potential longevity. This is, of course, just how it should be: the first mention we have of Barclay Perkins’s beer “specially brewed for the Empress of Russia”, from 1796, said it “would keep seven years”. If the W&Y version is indeed like the Courage one, at seven years it will be just an adolescent: it looks set to be a fine beer still after 20 years in bottle, and perfectly drinkable at almost twice that age. Great post, just a pity to loses such a great part of brewing history. I brewed a clone version of Courage RIS (1937) courtesy of Ron blog. back in 2008 before the birth of my first daughter. At her third birthday this May it will be three and half years old, their great beers to try from year to year. I wasn’t that keen on the first bottle, but plan to keep the second a few years and reassess! ALways interesting to see how beers change over time. I’ve got a bottle of 1985 tucked away too so I’m looking forward to doing some comparison as well. When I manage to get my mitts on one of the new bottles, that is. Blimey, twice in one day. The revival of Courage Imperial Russian Stout is really down to Tim O’Rourke and his Great Baltic Adventure. When he first contacted Wells and Youngs they said Heineken owned the brand and it’s only recently that they announced they’d now bought the remaining 17% of the Courage brands. As to the bitterness, the 1976 recipe Tim sent out had just over 100 IBU if I remember rightly. Thanks, that’s very interesting: I wasn’t certain if the version you sent me was the same as the Tsar Top, so I didn’t know if I should have been getting the Brett, but like B&B I didn’t find it if it was there. MJ definitely though the IBU in 1993 was only about 50 – I wonder if they dropped it? Probably too young for much brett character. All recipes I’ve seen are hopped like crazy, from the 1850’s to the 1970’s. I didn’t get any Brett taste in the two bottles of Wells Young IRS I sampled (one shared with a group, the other on my tod). I doubt there is any Brett in it. 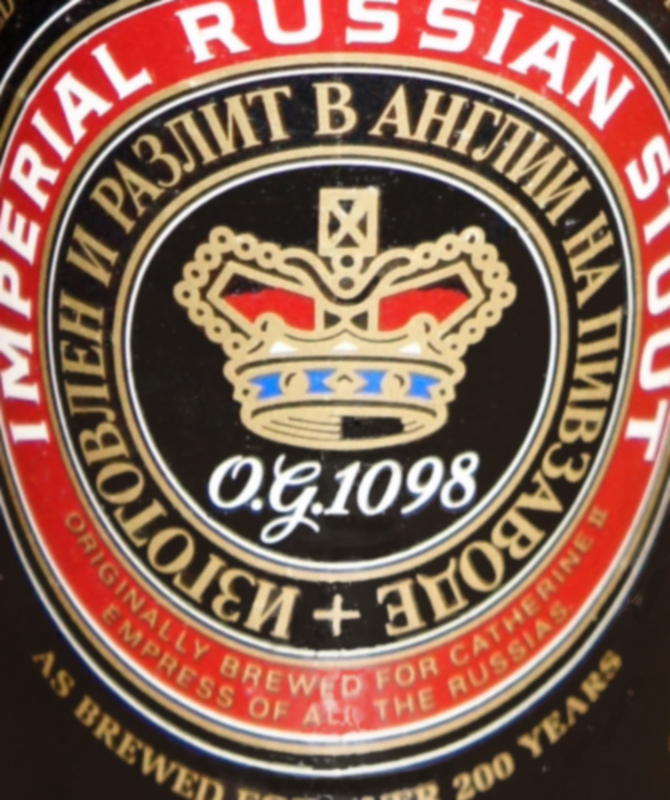 When the stout was aged for a year or more in the Russian cellars in wooden pins, surely that would have imparted a Brett taste, and it was noted by Michael Jackson in his earliest books, i.e., when the beer was still brewed in London. I’m not sure about the Tadcaster era. Once the beer was bottled without lengthy storage in wood, which it was at least by the end, I’d doubt there was any Brett in it but perhaps some was introduced in some way. I have never liked the horse-blanket taste, never. I was very glad of the clean rich taste of the restored beer. The only flavour I got on top of malt and hops was fruity esters and these were welcome, indeed of a piece with 1700’s description which stressed an elderberry or port-like character. Martyn, excellent notes. I’ve tasted the Wells Young as well and found it excellent, winy and rich with an elegant taste – if an Imperial Stout can be elegant that is! It was noticeably hoppy, I agree Given Jim Robertson brewed the same beer “back when” and presumably had access to the records, I’d think he wouldn’t have changed anything in the matter of hops. But then too as we all know the mysterious cone often produces differing results under seemingly similar circumstances. One thing for sure is that the 1800’s examples would have had something like 7-8 lbs leaf hops per barrel, so very bitter indeed. I suspect the hops in the ’92 that you had in ’94 had toned down quite a bit in the two years, but again hop character is not easy thing to pin down especially historically, just too many variables. I seem to recall Jackson writing that the OG dropped in the final years of production. Did your earliest bottles mention a higher OG than 1098 or higher ABV than 10%? If there was a drop as I apprehend, why would this be I wonder? I grabbed a bottle of the new IRS a few weeks ago. It’s as black as pitch, and tastes like a tobacco-leaf wrapped plum slice, dipped in espresso-infused dark chocolate. It’s smokey, leathery-sweet and drinks like a beer half its strength. It didn’t seem hoppy to me. Bittered nicely, but not overtly hoppy. Sorry about that, the last part got snipped off. This sounds like one Hell of a vertical tasting! Not all at once, of course: a bottle a day. Harvey’s of Lewes used to brew a delicious Imperial Russian Stout, that came in a corked bottle, under licence from a Belgian brewer & proved, if nothing else, that some beer brewed in the UK under licence from Belgian firms can be more than acceptable. Excellent post, Martyn (& interesting additions from Craig). I’ll look forward to trying some of the new W & Y Imperial when I get back to the UK. I’m a little upset that I wasn’t sent any bottles. And not just because I can’t buy them here. I’ve closely inspected online colour images of bottles from various decades going back to the Thirties. From these (which may not be complete, e.g. no rear label was shown) I saw no reference to original gravity or an alcohol content whether GL or Sykes. Nonetheless, I did find one source which claimed that Barclay’s Russian Stout had (this would be post-war era) an OG of 1100 or greater. It seems it did fall to 1098 in the last years of production and also, I recall Jackson saying it wasn’t bottle-conditioned towards the end. By that as it may, I doubt these factors would affect a vertical tasting covering both eras very much, i.e., given all the variables. I might add: the taste of the Wells Young is very much in the vein of numerous American Imperial Stouts. It’s better than most IMO but their very best is on a par and possibly a tad over. The 1992 and 1993 are definitely bottle-conditioned. But I’ll check, I thought Jackson had said this, I could be wrong. 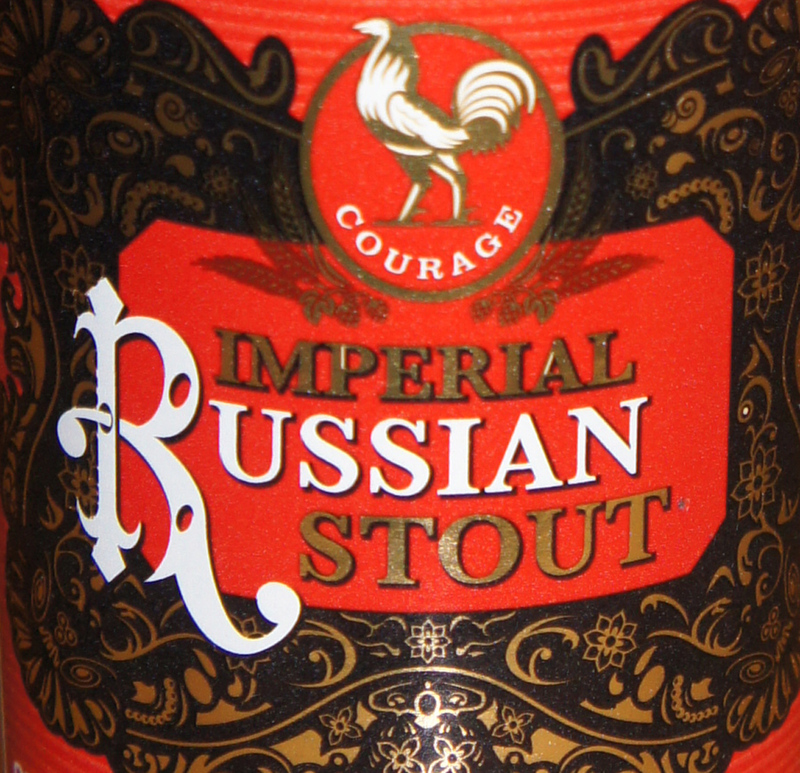 “Courage’s vintage-dated Imperial Russian Stout is the classic example of the style. Its appearances are sporadic, sometimes at 1098 rather than the original 1104, and not always bottle-conditioned…”. In Jackson’s Beer Companion (1993) he states of the process for the same beer at John Smith in Tadcaster that the beer was bottled “unfiltered”. I would therefore agree that the last two years of production (until the revival and not counting the “glimmerings” noted by Des de Moor) were bottle-conditioned, but clearly some prior bottlings were not. I knew there was some variation in the OG range, e.g, I had checked the interwar Imperial Stout table on your (Ron’s) site. I wonder if the brewery had a target OG for its export or best Imperial stout but sometimes missed it by a little, but it doesn’t matter anyway as the effect on palate surely would be minimal. Now, if the story about pilsner malt in the mashbill can only be solved! One thing about Jackson that I noted early on was his concern not to water down the traditional character of beer. He saw every little change as incremental… Some of this probably was not justified (i.e., in terms of palate) but one can see where he was coming from, he was always worried that a traditional taste would in time be irrevocably altered. But one thing I’m sure of is he would have been hugely gratified to see the restoration of Courage Imperial Russian Stout and would have been wowed by its quality, of that I have no doubt. I was at the London launch of the Wells & Young’s Imperial Russian Stout at the Calthorpe Arms on 24 October last year. A couple of Jim Robertson’s comments that I noted might be of interest: He felt that a long (3-4 months) maturation period set the beer apart from other modern IRSs and gave the beer a better depth of character to the modern (mostly US) imperial stouts he had tasted. He described the first brew as “a bit of an experiment” and said they had been pleasantly surprised when the whole batch had sold out in eight hours and could have been sold five times over. Almost all went to the USA – 900 cases of the 1,100 cases produced – with “almost none” left for the UK market. He said the beer will be brewed again and that he was inspired to “bring other beers back from the dead”, but not Courage Bulldog, a brand W&Y’s do not own. Grabbed 3 bottles of this tonite. Hoping to split one with a good friend, enjoying it fresh, and cellaring the other two as long as I can resist. I wouldn’t have known to grab these when I saw them if it was for you Martyn, so cheers, mate. Hi, i was lurking around and came upon this article. I just dusted off a souvenir ’76 bottle given to me as a souvenir from a lad in Southampton on my visit from Canada. Had it in a cupboard on display for ever. Never exp to sun or ext heat. Wondering if it was still drinkable and worth opening. Im a pils lager drinker, but stouts, even Guiness, i can t drink more than one. Should i serve it room temp.or colder? Yes, it should be drinkable – chill it slightly, and pour carefully.